Wed., Nov. 22, 2017, 4:13 p.m. The Territorial Cup, the Civil War, the Apple Cup and the Rumble in the Rockies. Two of these games have major implications, but with the college football season winding down, you might as well get try to get to all four. UCLA by 7 – The weekend Pac-12 slate opens and closes with games between five-win teams hunting for bowl eligibility. It often comes down to the quarterbacks in these scenarios, so advantage Bruins. The pick: UCLA 42, Cal 35. 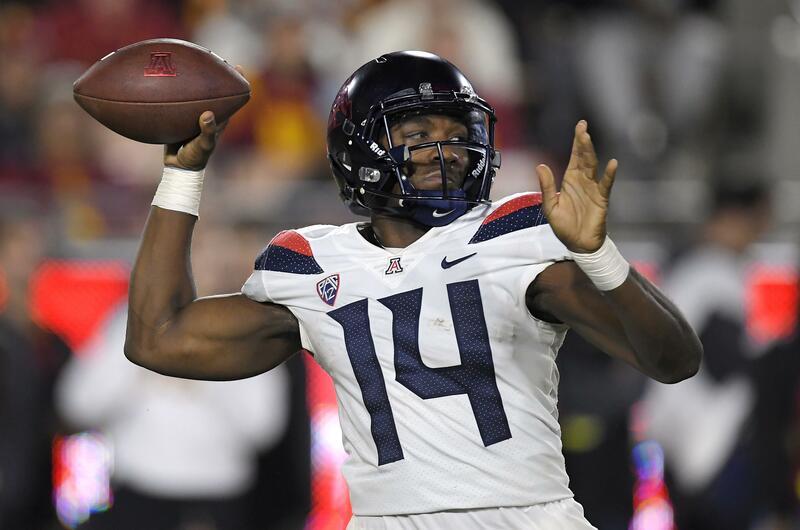 Arizona by 1 – I think Khalil Tate and the Wildcats get their act together in the Territorial Cup AKA “We’re Glad We Live in Arizona This Time of Year Bowl.” The pick: Arizona 58, Arizona State 37. Oregon by 23 – It’s simple: the Ducks are a different team with Justin Herbert behind center, and the Beavers are the same team they were when the Oregon quarterback went down. The pick: Oregon 51, Oregon State 24. Notre Dame by 2 – An exciting game in theory, but usually the stakes are higher when the country’s 8th and 22nd-ranked teams meet in late November. The Irish are out of CFP contention and the Cardinal have left their fate in the hands of the Cougars. The pick: Notre Dame 28, Stanford 24. UW by 10 – The Cougars have the presumed Pac-12 Defensive Player of the Year and the conference’s all-time leading passer. If they can’t win this game now, when will they? The pick: will be in Saturday’s paper. Utah by 10 – The Utes probably felt like they let one slip away in Seattle. They only need to play half that good to beat Colorado and clinch bowl eligibility. The pick: Utah 33, Colorado 27. Published: Nov. 22, 2017, 4:13 p.m.